The event took place at the Studio, a managed presentation space that is well suited to events like this. There was a decent size auditorium, a number of smaller demo rooms (of which Amulet had one), and a secondary presentation area used for some of the presentations, along with open space for people to mingle, a restaurant, chillout area, etc. Very nice facilities! About 60 people turned up in total. The event ran from 10am to 5pm. We had the Amulet Voice Remote running demos for the whole day, and also gave a formal presentation/demo in the presentation area at about 2:30 pm. 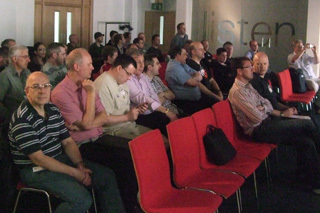 We were up against a DVBLink talk which proved very popular, so our audience size was small but very interested. I was pleased to find that everything worked very well. As usual, the most compelling demos happened when visitors had a chance to try out the voice commands for themselves. The new TV guide navigation capability elicited quite a few Oooh’s and Ahhh’s. Feedback on the general design and look & feel of the voice remote was very positive; people thought it felt solid and stylish, which was exactly what we were going for. People were also interested in the idea of having alternative software voices available to buy through the Amulet Devices website; that’s definitely something we plan to add later in the year. There was also interest in extending control to home automation, another area we’ve been looking at. For me, the event was a great opportunity to get to meet in person some of the well known names from the Media Center community. I had good conversations with Ian Dixon & Garry Whittaker of The Digital Lifestyle, Andrew Cherry of Digital Living Solutions, David Simpson of Evolve Media, Richard Hill of GridSearch (one of our co-finalists from 2008’s CES i-stage event), and of course Pete Brown of The Green Button, who had flown in from the US specially for the event. I also enjoyed chatting with the UK media center users. While the UK market may not match the US in terms of Media Center sales, it more than makes up for this in enthusiasm! 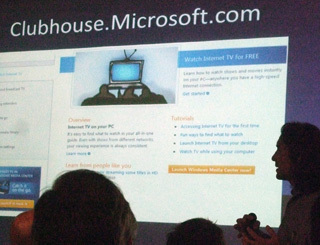 There was a lot of interest in Windows 7 Embedded Media Center, which opens up a path to get Media Center into a lot more living rooms without the stigma of having a “PC in the room”. As well as the formal talks, which covered everything from custom building a Media Center system to advanced MCML programming, there were plenty of Media Center accessories and addins on display in the public areas – some really impressive equipment. The organizers, Ian & Andy, lined up some fantastic competition prizes and hand-outs, everything from USB memory sticks to DVBLink licenses, a Zune HD, and even a Sonos S5 audio system, so nobody left empty-handed. There was even complimentary pizza at lunch, kindly organised by one of the attendees. Overall, a really enjoyable day and well worth a trip across the Irish Sea. Kudos to both Andy & Ian on a very well run event. Looking forward to the next one! This entry was posted on Tuesday, June 15th, 2010 at 10:57 am	and is filed under Events. You can follow any responses to this entry through the RSS 2.0 feed. Both comments and pings are currently closed. « CES 2010, Las Vegas not so hot!